Modern medical carts are a staple in today’s healthcare setting. They are proven to enhance organization, efficiency, and the overall workflow of medical facilities across the country. Several versions of the mobile medical cart exist, and choosing which one works for you will depend on your unique needs. Equipment and supply carts come equipped with drawers, bins, and workspaces. These areas help ensure that supplies are easily accessible when they’re needed. 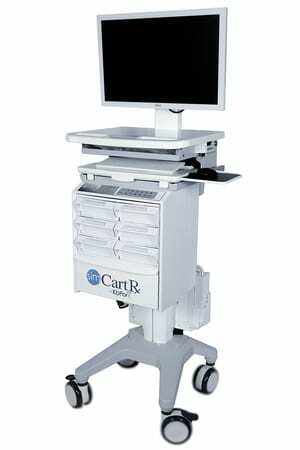 Equipment carts have spaces for medical devices such as blood pressure machines, thermometers, and the pulse-ox machine. Drawers and other bins can hold gloves, bandages, syringes, and other common supplies that are necessary for each individual department. Supply carts are customizable, so they can better meet the needs of the customer. Medicine carts come with shelves or drawers to hold common medications. The doors or drawers are lockable to restrict access. Locks can be keyed or keyless. Medicine carts allow staff to quickly access needed medications without going to the supply room or contacting the pharmacy. Supplies kept on hand will vary depending on the facility. An intensive care unit will keep different supplies on hand than a typical recovery floor. With customizable options, medical carts for hospitals can work for everyone. The computer-on-wheels units bring multiple benefits to patients and staff. They enable doctors, nurse practitioners, and specialists to quickly and efficiently make their medical rounds each day. With patient records available at their fingertips there is no need to return and retrieve medical binders between patients. Wheeled computer carts also allow better care to be given to the patients. With medical records easily accessible at the patient bedside, caregivers have immediate access to all areas of the patient’s history. This makes it easier to determine how to handle current problems and cuts down on human error in reporting. These units are lightweight and durable, making them perfect for pushing from room to room. They come equipped with reliable battery systems that allow staff to work worry free when it comes to losing power. The crash cart is vital for any floor of the hospital. From the emergency department to recovery to intensive care, having access to life-saving medications and supplies can mean the difference between life and death. Crash carts can be equipped with any number of drawers and shelves. Oftentimes the drawers and shelves will be color coordinated. This arrangement is meant to work for the customer, taking the guesswork out of finding needed supplies without hassle. 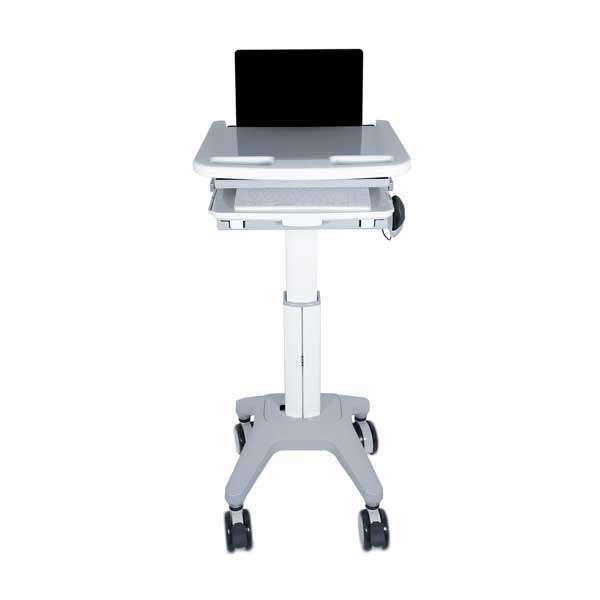 Mobile medical carts such as those sold through Scott-Clark are ergonomically designed to make them easy to maneuver and simple to store. They come in a variety of types and sizes to meet every need. Many facilities find they need multiple versions. However, most carts can be multi-purposed to meet a variety of needs. For instance, a supply cart can be equipped with locked drawers as well as a power station to allow medications, supplies, and a computer to work together on a single cart. With a medical cart on wheels, you can improve the efficiency of your department. Your medical team will be less stressed knowing they have what they need when they need it, and patients will find improved care. The various types of medical carts available today allow staff to worry less about finding the appropriate supplies and more about focusing on patients.